A George I gilt gesso mirror in the manner of James Moore & John Gumley, first quarter 18th century. The upright rectangular mirror with a two-piece plate, the sides and bottom with strips of glass split into seven sections by giltwood slips, the uprights at each side terminating in scrolling volutes, the shaped arched cresting of mirror glass within a carved foliate surround surmounted by a seashell emerging from seven ostrich plumes. John Gumley was a leading supplier of mirrors and pier glasses in London in the early eighteenth century. During the reigns of Queen Anne and George I, he worked for the monarchs and court in the furnishing of several of the Royal apartments. He occasionally worked in collaboration with the cabinet-maker James Moore, and it is in this partnership that we frequently see this particularly English interpretation of the French Régence vernacular. The present mirror is related to three others supplied by John Gumley & James Moore in 1715 for the Prince of Wales at Hampton Court Palace, though the offered lot relies more heavily on French models of the period. 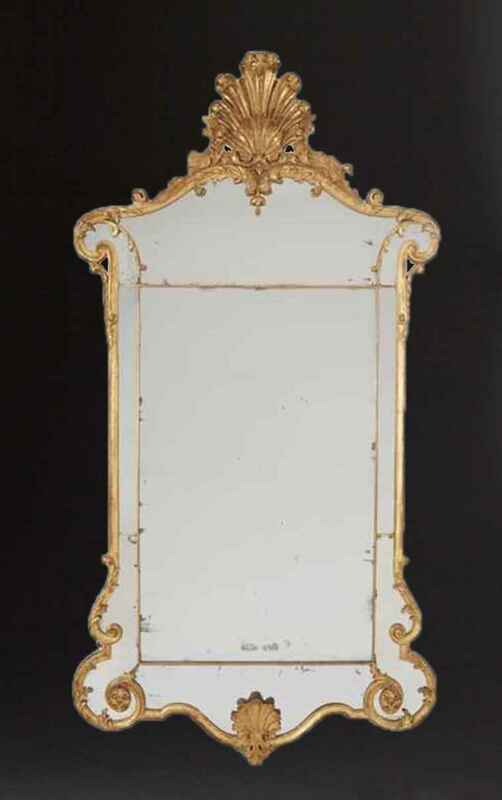 A George I gilt gesso mirror in the manner of James Moore & John Gumley, first quarter 18th century. The upright rectangular mirror with a two-piece plate, the sides and bottom with strips of glass split into seven sections by giltwood slips, the uprights at each side terminating in scrolling volutes, the shaped arched cresting of mirror glass within a carved foliate surround surmounted by a seashell emerging from seven ostrich plumes. John Gumley was a leading supplier of mirrors and pier glasses in London in the early eighteenth century. During the reigns of Queen Anne and George I, he worked for the monarchs and court in the furnishing of several of the Royal apartments. He occasionally worked in collaboration with the cabinet-maker James Moore, and it is in this partnership that we frequently see this particularly English interpretation of the French Régence vernacular. The present mirror is related to three others supplied by John Gumley & James Moore in 1715 for the Prince of Wales at Hampton Court Palace, though the offered lot relies more heavily on French models of the period.